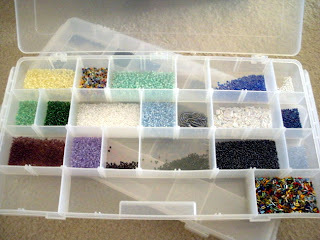 Just peeking in here for a minute to let you know that while I haven't been able to DAILY work on the craft room/go through beads. I have been able to get some of it done. 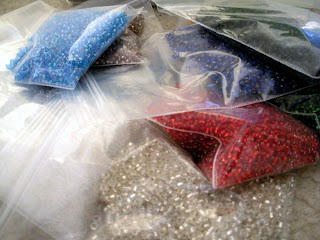 Above are just some of the MANY seed beads I've bagged up. I've separated them into the ones I'm getting rid of and the ones I'm keeping. 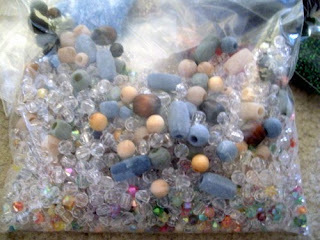 Here are some of the other beads (mostly plastic) that will be leaving my house by some means. So, without further ado - here are some links for "Thrifty Thursday"
Some ideas for the batch freezing of foods. This one's called the 5-day freeze. In general, it's a great idea. I just don't use enough peppers or zucchini to freeze batches of them. I do like the idea of having these things on hand though. Don't rebuild that tired-looking wood deck, just flip the boards. What a great tip! Did you know you could buff out dings in wood with a walnut? I didn't, but it's worth a try. Weird dutch site that gives ideas for how to re-use/re-purpose some items. Some of them I don't get or think they kinda weird, but the rest are pretty neat ideas. Click through the gallery. One dollar designs. . .simply beautiful. I've already gotten one whole BIG tackle box cleaned out, but still have a bit more to go. Wish me luck!